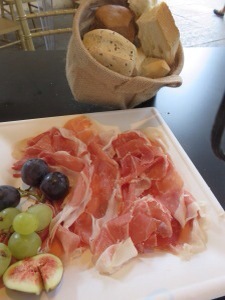 Parma ham is everywhere in Parma….go figure! But I was craving a salad. It seems that Italians don’t eat a lot of veggies. Lots of pasta. Lots of meat and fish. But not a lot of vegetables. I got my veggie fix with a nice tuna salad for lunch. 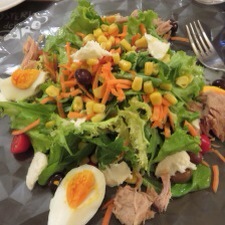 Mike had a salad, but way lighter on the greens. 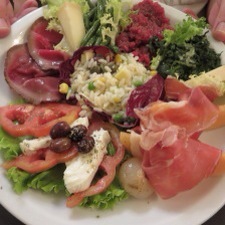 The ground meat the second salad is HORSE TARTARE. Now, I tried horse in Paris and it was good. Mike thought it was great! But RAW horse was a little over the edge for me. 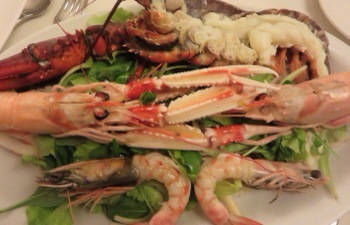 Continuing my quest for greens, I ordered a seafood salad for dinner. Hmm. Not exactly what I was expecting. An hour later, tired of cracking and prying, I think I burned more calories working at dinner than eating it! Everything ok – you haven’t posted in a while? Almost over the alcohol ban! All is good. Bad internet here. Couple more days on the alcohol ban. Ugh! !